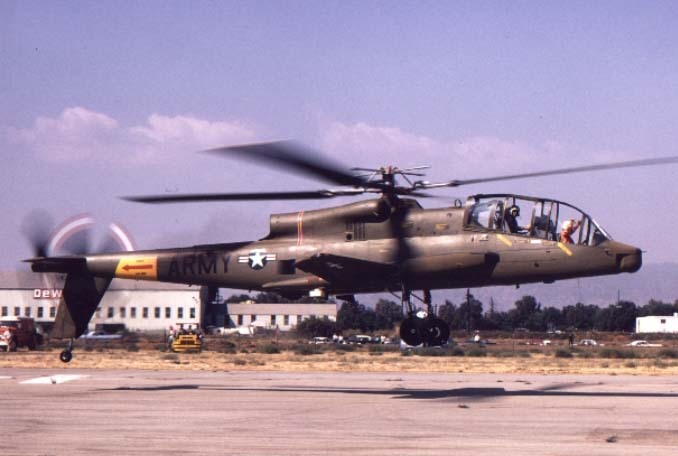 Here are a variety of pictures of the Lockheed Cheyenne AH-56A, an experimental Helicopter from the 1960s-70s that partially unloaded its rotor and also used a pusher prop. 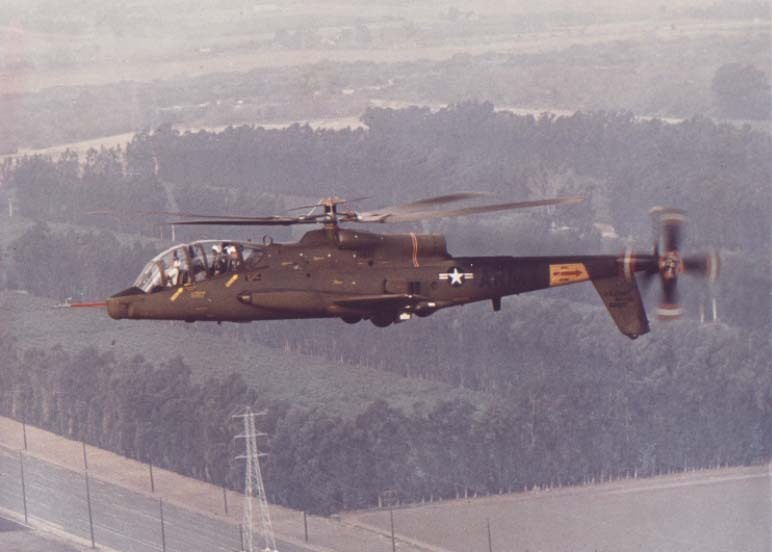 Lockheed created a flying model with a 5 foot diameter, two bladed main rotor with a fixed collective pitch control. Power came from a single McCoy 60 model airplane engine which turned the rotor through a combination belt & gear drive with an 8:1 reduction ratio. The model helicopter proved very stable and easy to fly. The concept had been proven and now it was time for a full scale aircraft. Of interest to modelers is the fact that a radio-controlled model of this helicopter was flown in 1958, making it one of the very first successful model helicopters, if not the first. The model weighed 11 pounds with a 5-ft. diameter main rotor, 2-blade and constant 2 1/2" chord. A McCoy 60 drove the main rotor at 1012 rpm. The radio was a 8-channel Citizenship reed outfit with 6 channels being used - two for pitch, two for roll and two for throttle. A large "gyro" ring was later added under the rotor. The model was flown extensively at Sepulveda Basin, Los Angeles. A very early test flight. Shortly after this pic was taken, one of the experimental AH56A craft experienced a rotor blade control failure. A blade sliced thru the pilot compartment (back seat) killing the pilot. Note the normal tail rotor but note there is also the pusher prop of about the same diameter, alongside it. The Cheyenne had a most remarkable (if not the most remarakable) rotor system. The techniques employed for tilting the rotor were (and remain) unlike anything ever devised. To directly change the angle-of-attack of the (rigid) rotor blades. The gyro had direct links to the blade pitch horns (these can be seen in some of the pics). So the *only* way to change pitch of the rotor blades was by causing the upper gyro-gimbal to tilt in what ever way it could be made to tilt (or in moving the gyro-gimbal vertically if collective pitch changes were commanded). that the lower swash-plate would have a moment or 'force' applied at its' rear from the spring loaded rods connected from the pilot's servos to the outer, non-turning part of the lower swash-plate. Because the swash-plate was directly coupled to the upper gyro-gimbal, it would follow the behaviour of the upper gyro-gimbal and would not tilt with the applied force but resist it. The springs pushing on the swash-plate outer ring would compress as the pilot pushed the cyclic stick forward. Thus in final summary, the tilting push began 180 degrees before the actual tilt occurs as to tilt the helicopter forward, the pilot's cyclic servos apply a spring-loaded force at the 180 and 0 degree positions on the outer non-turning ring of the lower swash-plate. The swash-plate, because it is coupled to the upper gyro-gimbal physically tilts at the 90 degree (port) & 270 degree (starboard) positions. The upper gyro-gimbal which through gyroscopic precession, caused the 90/270 tilt, also applies maximum and minimum pitch to the rigid rotor blades at the 90 & 270 degree position - because the craft has a rigid rotor and due to the effects of gyroscopic precession, the whole craft tilts at the 0 degree (nose down) and 180 degree (tail-up) positions. The tilt of the craft is totally due to gyroscopic precession. This of course is not what tilts a rotor system that is not rigid, i.e. has free teetering blades.